I was first introduced to malawah, a flaky, slightly sweet and buttery Yemenite bread, by my husband who loved making it as a late-night (usually post-drinking) snack, a habit he picked up from his time in Israel. As Leah Hadad writes in Jewish Food Experience, it was brought over to Israel by Yemenite Jews and became popular, cropping up in a variety of sweet and savory dishes. Kosher in the Kitsch’s Nina Safar even makes a savory hamantaschen using malawah. My family now enjoys making it simply with butter, cinnamon and sugar as a sweet treat but I also love serving it with a spicy tomato sauce for an easy dinner. 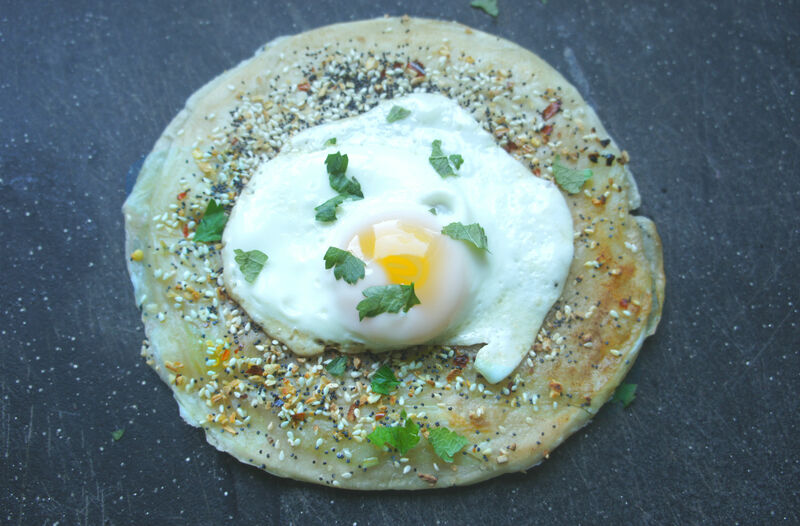 In this brunch-perfect dish, I add some classic Jewish-American flavors and coat it in homemade spicy everything mix, then top it with a fried egg. And since I use frozen malawah (you can find it in the freezer section of kosher markets and some major supermarket chains), it’s an easy dinner when you are short on time or want to enjoy a lazy Sunday breakfast. Add some crumbled feta and Israeli salad for an even more complete meal. To make the spicy everything mix, combine sesame seeds, poppy seeds, minced garlic, dried onion, salt and red pepper flakes in a small bowl. Set aside. Add 1 tsp butter or olive oil to a large saute pan set over medium heat. Add frozen malawah to pan and cook according to directions, around 3 minutes. While first side is cooking, gently sprinkle even layer of spicy everything mixture on top, and press into dough. After 3 minutes, flip onto second side and cooking another 3 minutes. Some of the spice mixture will fall off. Fry eggs according to your taste in 1 tsp butter or olive oil. (I suggest cooking over medium-low heat and putting a cover on top so eggs don’t cook too fast, but that the white sets and yolk remains runny). 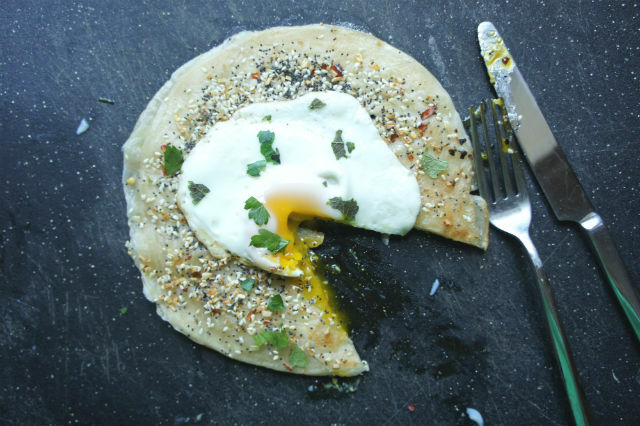 Top malawah with fried egg and sprinkle with fresh parsley if desired. Serve immediately. Kick your day off with a healthy, beautiful oatmeal bowl you'll actually enjoy eating.